Back in the 12th century, when crusaders belonging to the Order of St. John of Jerusalem returned to France from the Middle East, they brought all kinds of souvenirs home. Some of these souvenirs were grape vine cuttings from a variety native to Cyprus called Negrette. Intensely perfumed like a Mediterranean garden, when you drink a rare variety like Negrette, you are drinking history. The grape may well have died out were were it not for a few careful viticulturalists around Toulouse who resisted ripping out the vines out and planting Cabernet Sauvignon in their place. What a loss that would have been, because you have never had anything like it. 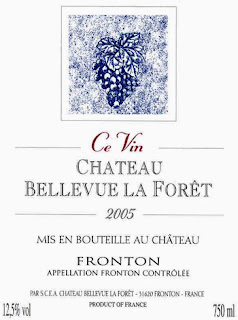 The Chateau Bellevue La Foret Ce Vin is a 100% Negrette wine, and was not blended with other red varieties which is common in the region. ($11.84, Garagiste; available elsewhere for under $10) It was deep plum verging on aubergine in color, and smelled like a garden. I detected aromas of violet, plum blossom, and jasmine with a touch of spice that managed to keep it from becoming cloying. Flavors of rich plum and sour cherry were combined with nice, spicy notes. The wine was low in tannins, and when it was first opened the aromas overwhelmed the other aspects of the wine. I think it could do with 6-12 months more age in the bottle, or about an hour of decanting to be at its best. Very good QPR. Negrette is not on most food and wine pairing charts, so you may be stumped with what to have with it. I would recommend something aromatic and meaty, like Korean BBQ beef ribs or a tasty stir-fried pork with tomatoes and basil. Both dishes will pick up the peppery spiciness of the wine, and the wine will do its bit to accentuate their full flavors. If you like Syrah and Grenache, you will love Negrette. Keep your eyes open for a bottle, and taste some history. A very interesting post about a grape I have never heard of before. It sounds enticing so I will keep my eye out for it while perusing the local wine stores. I didn't purchase this from gargiste when it was offered, but I often purchase the rose made from the same grape in the summer. It is an excellent wine. I'll have to keep a watch for this wine. I'm intrequed by your description of it having floral aromas and the taste sounds great. Fiyr more to grapes to go!!! Do you have a special one picked out for #100? I just opened a Negrette-heavy blend last night thinking I was the only blogger in the blogosphere drinking this stuff. Then it turns out you are posting on it today, and to boot, you are not the only blogger to mention this cuvée in the last 24 hours. I like the interest you are creating for this style of red wine -- one I find that is typically on the Italian side of Syrah and Grenache blends. I think a dish rich with tomatoes and meaty (with iron, like beef) like you say often brings out the freshly floral and sunny, if sometimes vegetal qualities of Negrette. Sounds like an intersting varietal. I don't think I have come across it in my local shop before but I will have to keep an eye out for it. look forward to trying this one! Thanks! Am I missing something or did you drop the QPR ratings? I see a very good QPR tag below, but nothing in the body of the post. I look forward to hearing about everyone's experiences with the grape--there's not a lot out there on it, so it's up to us to spread the word. Thanks for the rose tip, Andrew, and Jill--it was an oversight. Thanks for the heads up. DeRose Winery in Hollister tend a few acres of old Negrette vines in part of the old Almadén holdings. Al & Pat DeRose´s American version impressed me for its texture, a dense rose petal carpet that reflected the subtle but deep flower notes in the nose. Hope I get a chance to share a first experience of the French version with my friend Mark in LA around end of June...thaks for your great writing, good Doctor! Also known as Pinot St. George this wine is grown in small amounts in CA - mostly Monterey and San Benito Counties. The examples I've had are definitely along the lines of leather and game against darker fruit. We were at DeRose a couple of weeks ago. This is a fantastic varietal and the first time we've ever heard of it. They have a mere 5 acres of old vine Negrette. They're one case less in their inventory now. Highly recommended.